Petunia - a beautiful flower with unpretentiousdelicate aroma. 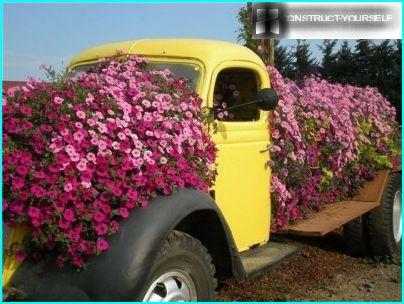 A huge variety of colors and varieties allows you to create beautiful flower beds of petunias. 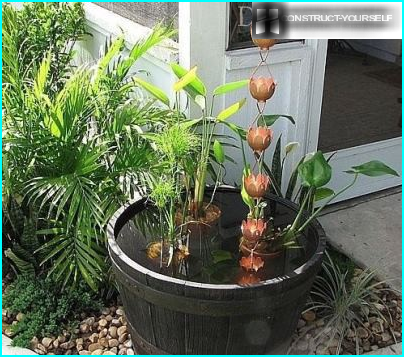 In the modern landscape design is one of the most popular colors. Caring for Petunia is easy, it is drought-resistant plant, which is not afraid of the heat. Dislikes petunia only stagnant water. Petunia has now become an ornament club rabatok, windows, balconies, vases, flower beds, borders - where only it can not be found! Luxury cascades of flowers almost all possible shades delight us with the onset of summer to the very cold weather. What good is the flower for a landscape designer? 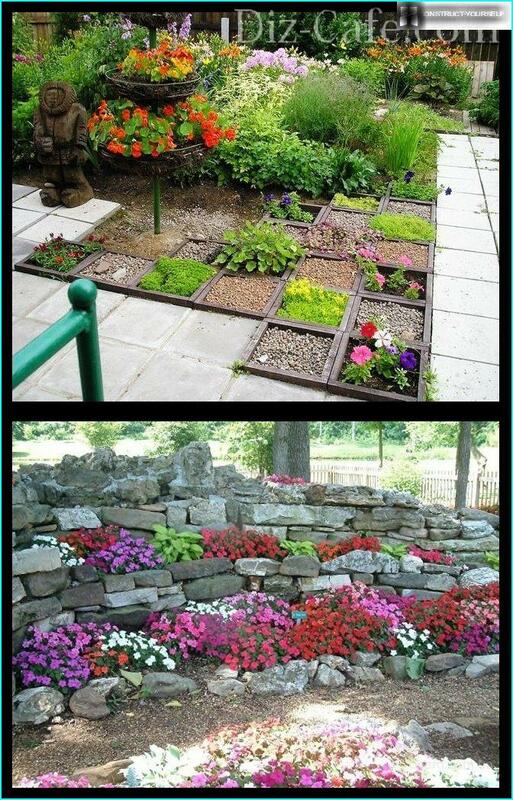 How can you make a beautiful flower bed? Option # 2 - bed nets from a "live tower"
This flower is native to South America, specifically -Brazil, perfectly adapted to our climatic conditions more severe. Although planting petunias now found on every continent, even in Alaska. As a considerable number of perennial plants, cultivated petunia we as an annual plant. For its propagation is mainly usedseeds. When planting seedlings at home can begin as early as March to the end of April - beginning of May (depending on climate) to plant the young plants in the flowerbed. Seeds planted in the flower bed is not much point - for seedlings need special care and is best planted in open ground it sprouts - so you will wait for flowering, and flowers transplant well tolerated. Breeders because of the huge popularity of plants engaged in breeding of new varieties and hybrids of garden groups. 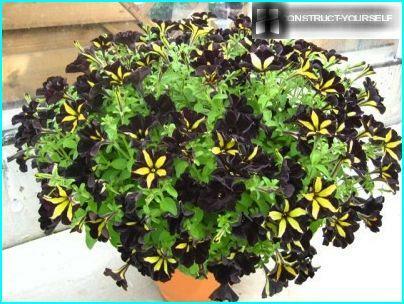 Sometimes flowers are so unusual that the appearance of the container loses value - as in this case, all the attention will be drawn to the stunning flower varieties "Black Velvet"
In petunia hybrid powerful root system, it isplant can be grown in containers of limited volume. The hybrid petunias are more luxurious flowers such properties make it possible to create one beautiful vertical beds. Petunia is good, whatever her plant. 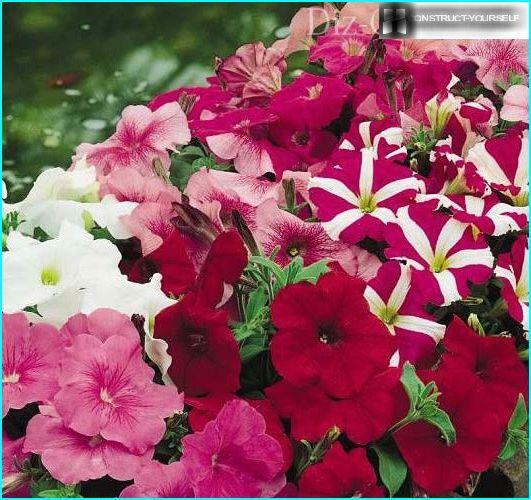 To create a circular flower bed of petunias can be used only one kind of the same color, for example, only the bright pink or purple flowers. Gently blanch the border, and you have a wonderful bed. Good looks petunia and in combination with otherflowers - Begonia semper florens, snapdragons, stocks, crops with decorative leaves. Beautifully combined it with marigolds, especially if large orange or yellow marigolds planted at the edge of the flower bed. In early summer blooming pansies and primroses -it is also good for the neighborhood petunias. 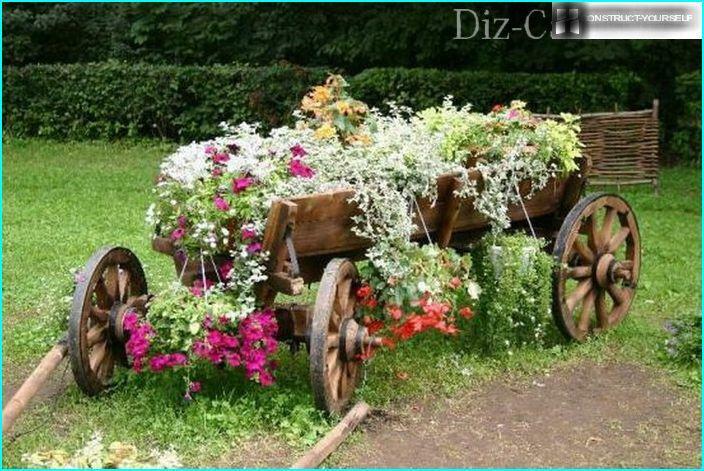 Good looks and a combination of the flowerbed with onion - hazel in the center, or lilies, irises, hyacinths and tulips. Petunia grows well in the sun and in partial shade, and therefore suitable to decorate the garden penumbral regions, especially in the company of hosts, ornamental grasses or Tradescantia virginiana. If you want to plant petunias in pots, it can be successfully combined with pelargonium or fuchsia (Fuchsia although much fastidious) or balsam. 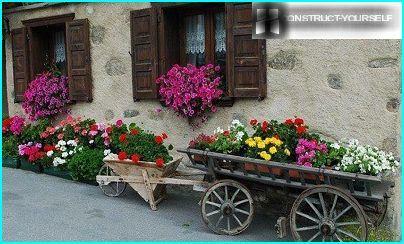 Today, the landscape design all original welcome. 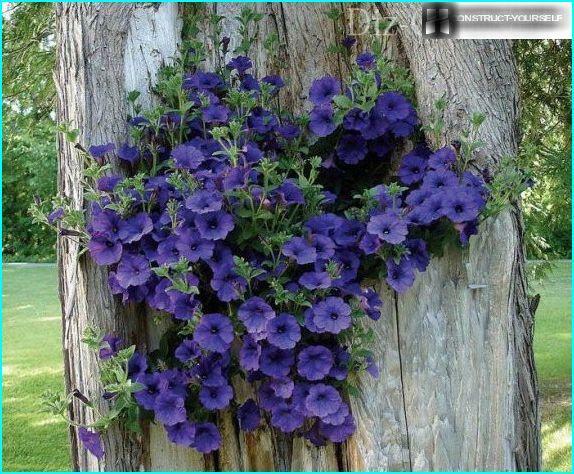 Why not use the old hollow tree as a place ampelnye planting petunias. Composition - sight for sore eyes! 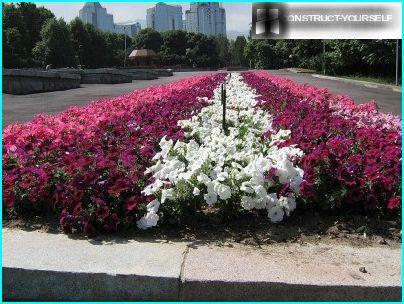 Modern flowerbeds - it's not just carpetplanting, to create a vertical beds of petunias can buy special containers of various sizes, mounted on a pole. 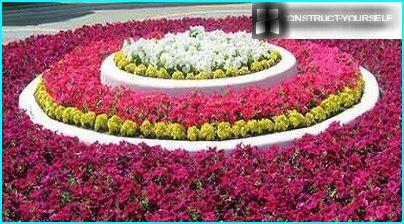 Pick your favorite varieties and colors - and vertical flowerbed decorate your site. Good as a monochrome or polychrome gamma. Vertical bed of petunias can beand using the created mesh. 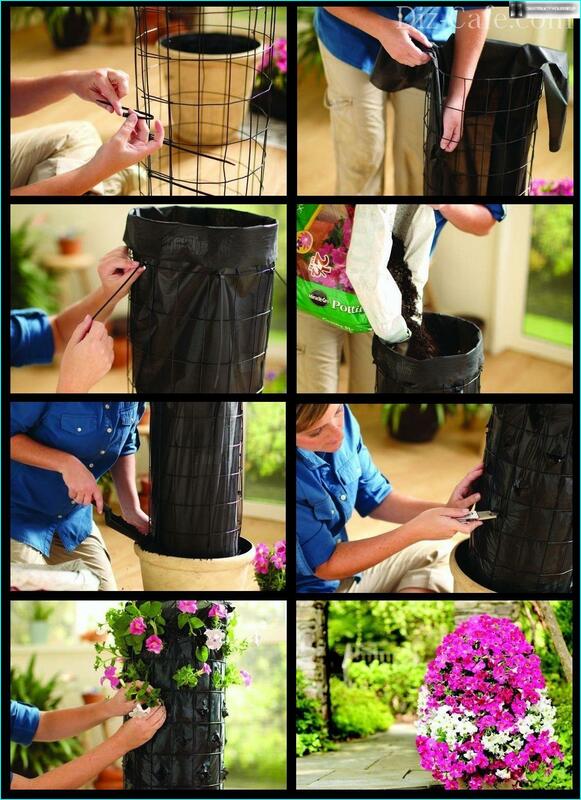 You will need to mesh the pot, tissue and seedlings. From doing grid frame as a cylinder within the frame have a cloth put down pot desired size, the structure is filled with soil. 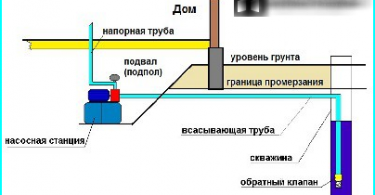 Pour the ground that it has settled, fill up, if necessary, thicken the entire volume to the pot. Then cut the fabric in several places, and planted in the holes at the top and the design of the plant. It now remains only to pour "tower" and watch it be transformed into a wonderful flower garden. 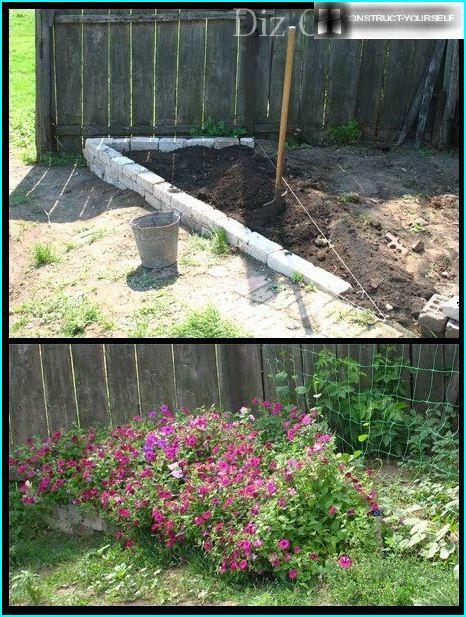 You can make a vertical flower bed usingWindow boxes - for example, on the wall of the barn, placing them in an interesting manner. They will grow and the usual, and hang-downing petunia that will look good with pelargonium, verbena, lobelia and ivy. Today, many satisfied in their areagravel garden - it's easy and it looks very interesting. Among the ornamental grasses, lily, effectively will stand and the site of petunias - free part of the soil under a bed, to protect her and dropped bordyurchikom plastic flowers - especially impressive against the background of gravel looks dark petunia - burgundy, purple. 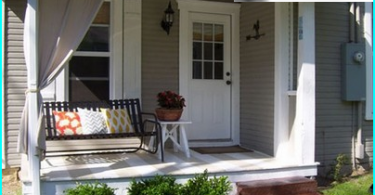 You must select a tile rectangular in shape, and put it in a certain order - get original decorative border, in which the frame can be planted any desired grade. Vacationers knowingly loved Petunia - with all its unpretentiousness it has decorative properties, which can be compared to a few garden flowers.